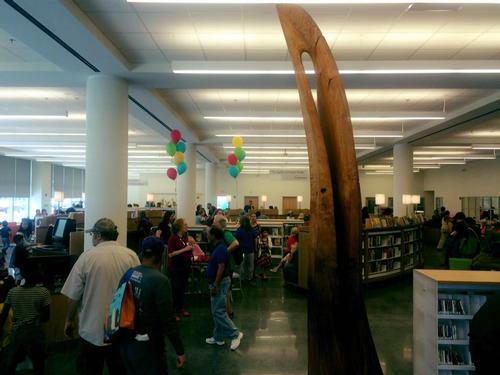 The New South Philadelphia Library Is Now Open! This past Saturday, together with the other partners of the recently opened South Philadelphia Community Health and Literacy Center—the Children’s Hospital of Philadelphia, the City of Philadelphia’s Health Center 2, and the DiSilvestro Recreation Center—South Philadelphia Library held a celebratory neighborhood block party, welcoming neighborhood friends young and old to enjoy rides, games, face painting, music, and entertainment on its surrounding streets. Community members also had the opportunity to explore the library’s new home. South Philadelphia Library, located at 1700 S. Broad Street (corner of Broad and Morris Sts. ), is the first of five pilot neighborhood libraries to be reimagined and reshaped to meet the changing needs of today’s library customers as part of the Building Inspiration: 21st Century Libraries Initiative. With 12,000 square feet of state-of-the-art space, it includes a Community Health Resource Center with staff trained by the University of Pennsylvania Center for Public Health Initiatives. The new space also houses a "living room" area where customers can gather with friends, engage in library programs, and interact in a warm environment. On display in the Children’s Library is a mural by renowned late author and illustrator Maurice Sendak. The only surviving Sendak mural, it has been on display at the Rosenbach for nearly five years. It will have a new life at the library, which also includes a teen space, a Pre-K Zone, a computer lab, and updated study rooms. Stay tuned for upcoming programming at South Philadelphia Library and come visit its incredible new space at 1700 S. Broad Street (at Morris) soon! 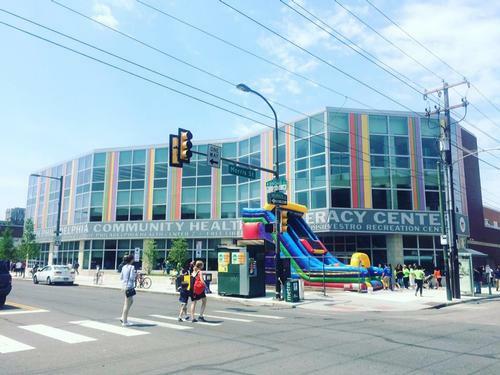 South Philadelphia Library Grand Opening Block Party! 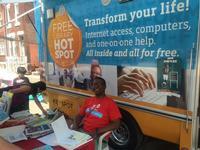 Ken Manns, Director, Volunteer Services Program, with the Techmobile outside South Philadelphia Library's grand opening block party. Patrons exploring all the new books, computers, and other facilities at the new South Philadelphia Library. I also received an email notification about this library .... But where is it located?? It looks like Broad and Morris in the picture. So glad to see the new branch open for business! We need lots of such spaces for today's young people to grow and to expand their minds and their joy of learning. I assume that's where the old library was. I spent many, many happy hours there. Can i check out and dropp off books at this location? Hi. The address is the first line of the second paragraph. It's great that this library and health center are back in action! The web posting from the main page had the address. The email didn't. Now that branch is complete, I hope you have funds left over to fix the computers at the Walnut St. Branch...especially #11. They are old, die out before time is up, and no one is around to fix the problem when work has been erased. 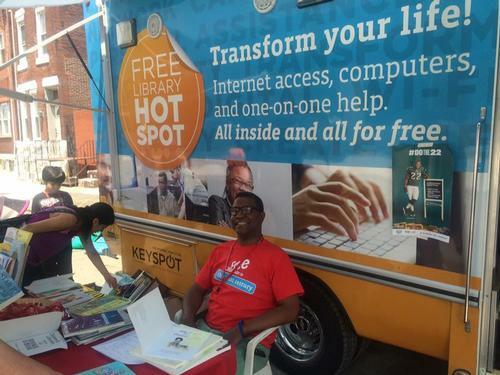 What are the other pilot neighborhood libraries to be reimagined and reshaped? Please advise of the other locations. Hi Cee Cee. To help us better answer your particular question / issue, please click on the "contact us" link at the top of our website. Thanks. 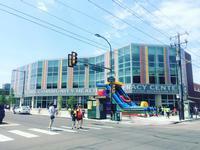 Hi Barbara, As part of the Building Inspiration: 21st Century Libraries Initiative, the South Philadelphia Library was the first of five pilot neighborhood libraries to be reimagined and reshaped to meet the changing needs of today's library customers. The other four libraries--Lillian Marrero, Logan, Lovett Memorial, and Tacony--closed in April and are now preparing to undergo extensive modernization and expansion. Each will receive physical upgrades, ensuring full ADA accessibility, and have a unique programmatic focus, chosen in response to identified community needs. You can read more via our blog https://libwww.freelibrary.org/blog/post/2549 and through the Building Inspiration website http://www.21stcenturylibraries.org/about-the-project/neighborhood-libraries/current-renovations. Thanks. Hi Mouloud, You can check out books but there is not currently a book drop off at this location. You can find out more about South Philadelphia Library at the following link https://libwww.freelibrary.org/branches/branch.cfm?loc=SPB. Thanks. I wish you would have a drop off site. The doors are glass but I am sure you could think of some way to provide this opportunity for the public. Add a Comment to The New South Philadelphia Library Is Now Open!